I say potato (poe-tay-toe), you say potato (pa-ta-toe). I say tomato (tow-may-toe), you say tomato (tow-mah-toe). Okay, so it's not quite the most wonderful time of the year yet (that would be in August, when the tomatoes are a scandalous, ready-to-burst red, and heat hangs in the air like a hazy bar circa 2003), but it's still pretty darn good. Yesterday, I was out at midnight, with nary a jacket, and I was warm. People of the Prairies, this is the stuff dreams are made of in Victoria. The clouds were spread out like lily pads on a pond and the white moonlight rippled through them, illuminating the inky blue sky. It felt good to be alive (to quote an Edwin song). Take some liberties with this one - use as many potatoes as you want, as much garlic as you fancy, a generous smear of butter or just a pat. I've made these precisely as well as haphazardly and they always turn out delicious. Bring a pot of deep, lightly salted water to a boil. 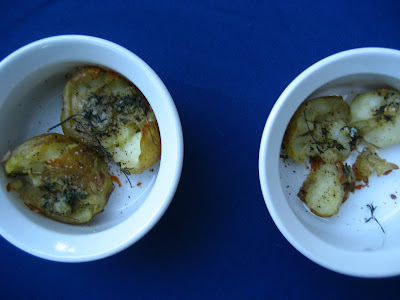 Scrub the potatoes and drop them into the boiling water along with the sprigs of mint. Boil for 15 to 20 minutes, or until tender, then drain. Meanwhile, peel and smash the garlic cloves with a sprinkling of sea salt. Pick the leaves from the sprigs of thyme and mash together with the garlic, butter and some freshly cracked black pepper. 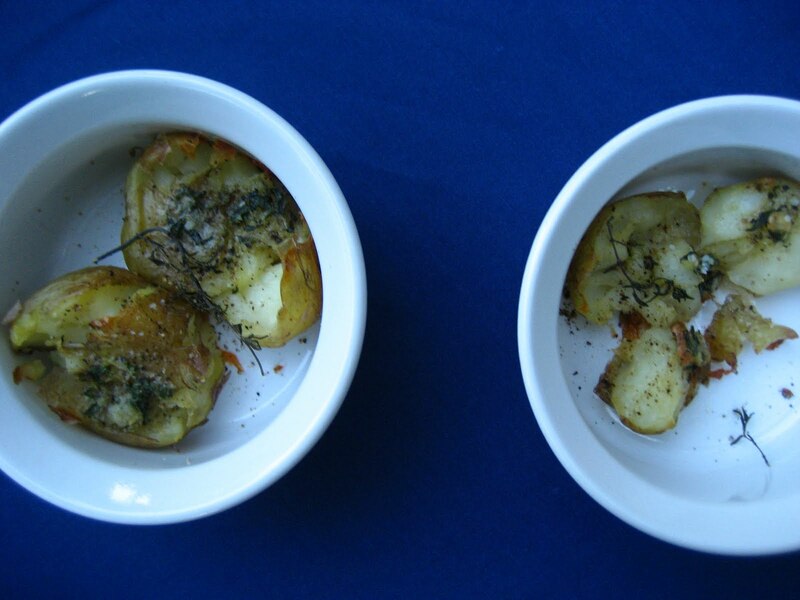 Place the drained potatoes in a shallow baking dish and crush each one lightly with a fork. Dab the herb butter over top, scatter with some more sprigs of thyme, if you like, and bake for about 40 minutes, or until lightly golden. Enough for about 4, as a side dish. Lately, a lot of the food I've eaten has come out of a can. I know, I know. I should be making things from scratch, revelling in the bounty of Spring (wait, isn't it almost Summer? ), blah blah blah. Well, I say heck, the sun is shining and I ain't got time to soak and simmer beans. Besides, I can't seem to cook those little devils properly. Half my batch is still toothsome when the rest starts disintegrating. Right now, canned will do nicely for me, thank you very much. With a trusty can of beans and some odds and ends floating around the fridge, I managed to knock together a lunch that was nothing short of sublime. An outta-the-ballpark, home-run sorta lunch. It was easy. I sauteed some aromatics, warmed my canned beans with a healthy splash of stock, then stirred in a good spoonful of crème fraîche. Meanwhile, I broiled a wedge of radicchio, tossed it in a balsamic dressing and toasted a slice of bread. I assembled the parts on my plate, sat outside and soaked up the sun. The beans took to the crème fraîche like fish to water. 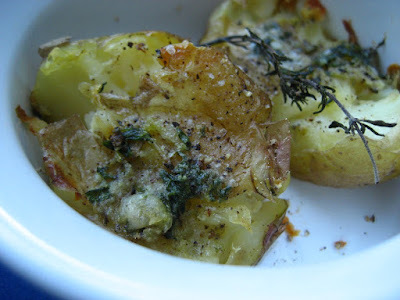 They were plump and creamy, mellow and smooth - a perfect foil to the peppery, slightly caramelized radicchio. AND, I think that the radicchio - being a member of the chicory family - counteracted any negative effects beans may have on your tummy (bloating, gas, indigestion, would you like me to go on?). I have not substantiated this claim but I still believe it to be true. To be honest, I barely measured as I made this recipe. Feel free to use it more as a rough guide than a Bible. If your beans greedily drink up all the stock before the radicchio is ready, add a splash more. Don't eat meat? Use vegetable stock. Don't have any around? Maybe there's a half-empty bottle of wine on the counter, or, at the very least, I know you have water. You could use heavy cream instead of crème fraîche, basil in place of parsley. C'mon, don't make any excuses, just make this! Heat 1 tsp of olive oil in a medium frying pan over medium-low heat. Add the garlic and rosemary and stir until wonderful smells start emanating from the pan. Dump in the beans and stir. Add the stock and simmer very gently until the beans are warmed through and the stock has been absorbed. Meanwhile, place the radicchio under the broiler and cook until wilted, about 3 minutes per side. At the same time, toast the bread on both sides - don't burn it! Whisk together 1 tsp of extra-virgin olive oil and 1 tsp of balsamic vinegar with a pinch of hot red pepper flakes and salt and freshly ground pepper to taste. When the radicchio is done, cut out the core and separate the leaves. Toss them in the dressing and arrange on a plate. Place the toasted bread on top. Once the beans are thoroughly warm and the stock has been absorbed, stir in the crème fraîche and turn up the heat. Cook briefly, until the beans are creamy and coated, then stir in the parsley. Spoon the beans onto the bread and eat. Makes enough for one glorious lunch, just for you. Okay, okay, I know what you're thinking - what should I do with the rest of the can of beans? Well, if you're like me, you'll open another can. That's right. Find yourself a can of tuna, not that light, water-packed stuff - what you want is Italian tuna, preserved in olive oil. Yeah. It's good. You don't really need to do anything with it. You could peel back the lid and call it dinner. But in this case, we're going to be a bit more civilized. Chop up some more new garlic, rosemary and flat-leaf parsley. Add a good squirt of fresh lemon juice and a grinding of salt and pepper. Throw in the other half of the can of beans plus a small can of tuna, oil and all. If you still have radicchio leftover from your lunch, you could slice it into ribbons or roughly chop it and add it as well. Toss everything together, pile it on crusty bread and eat ferociously. Supper is served. How's that for a woman, a can and a plan? There is one blatantly single-purpose tool in my kitchen. It is a waffle maker. A) I like waffles. But I only have waffles once in a blue moon, when I'm out for breakfast. Maybe if I can have waffles whenever I like, and at home, I won't like them anymore. B) The cardinal rule of outfitting your kitchen is that each piece of equipment should be versatile. Waffle makers are anything but. C) Everyone I know with a waffle maker uses it rarely, if not never. I mulled this over a good, long while and then, I bought one anyway. A simple request at my favourite thrift store and maybe 5 weeks later, for a whopping 5 dollars, a waffle maker was mine. And you know what? I have no regrets. Me oh my, I love me my waffles. Dozens of batches later - some duds, some diamonds - and I'm still hungry for more. You might like your waffles creamy but give these a try - they could become the new apple of your eye. Their crackly exterior gives way to moist pockets of tangy-sweet apple. With smoky, crisp bacon, flecks of cinnamon and a finishing drizzle of maple syrup you've got a waffle that nobody is going to waffle about. Fry the bacon in a medium frying pan over medium heat until crisp, drain on paper towels and, when cool, enough to handle, crumble. Reserve the bacon fat, if desired, to use in the waffle batter. Allow it to cool slightly without solidifying. Whisk the flour, baking powder, baking soda, salt, cinnamon and brown sugar together in a large bowl. In a smaller bowl, whisk together the bacon fat or canola oil, eggs, buttermilk and vanilla extract. Add the wet ingredients to the dry ingredients and fold together, just until combined. Gently stir in the crumbled bacon and grated apple. Cook according to your waffle maker's directions and/or whims. Makes enough for 4 hearty breakfast appetites or 6 daintier ones. Let's start at the beginning: First there was the egg and the egg was with fowl and the fowl was egg. Wait, sorry. Wrong story. Here we go again: It was the best of meals, it was the worst of meals, it was created by a professional, it was cobbled together by an amateur, it was tender, it was tough, it was bright and green, it was drab and brown, it was worthy of exclamation, it was outshone by the salad - in short, one chicken reigned supreme. It was the year of two thousand and ten, in the month of May, and I roasted a chicken (legs, please) with new potatoes, stalks of asparagus and bright lemon wedges. The skin of the chicken was burnished, the potatoes bronzed, the asparagus smooth and grassy, the lemon silky and tart. It was perfect with a hunk of baguette. It was the year of two thousand and ten, in the month of June, and I braised a chicken (breasts, ugh) with pale white cloves of new garlic, earthy morels and white wine. The garlic overpowered the morels, the pan juices weren't reduced enough, the chicken was overcooked and stringy, the wine old and resiny. It, well mostly the morels, still tasted good with a chunk of boule. Easy-peasy. Martha suggests using a shallow roasting pan - 3 inches deep or less - for dark, crispy skin. I suggest using a combination of drumsticks and thighs. Not only are they more flavourful, they lack the tendency to overcook as breasts do. Preheat the oven to 475 F. Place the potatoes and half the butter in a roasting pan; season with salt and pepper. Roast, tossing once, until the potatoes are golden, 20 to 25 minutes. Place the chicken, skin side up, on top of the potatoes; season with salt and pepper. Roast until the chicken begins to brown, about 20 minutes. Scatter the asparagus, lemon wedges, remaining butter, and thyme around the chicken. Roast until the asparagus is tender and the chicken is opaque throughout, 5 to 15 minutes. Serve chicken, vegetables, and lemon wedges drizzled with pan juices.